If you have an appreciation for beautiful homes and the Hamptons, this brand new release from Vendome Press is a must for your personal library. From the stunning cover from photographer Tria Giovan to the "inside story" by Jennifer Ash Rudick, you will savor every page. So many beautiful properties are featured in this visual "vacation" accompanied by fascinating textual background on them all. Beautiful, classic interiors are pictured as well as artsy, contemporary spaces. The Hamptons hold some of America's most beautiful landscapes and "Out East" highlights many of them. Most definitely a feast for the eyes! What a charming dining room.....replete with Frances Elkin's classic loop chairs, a favorite design of mine. Interior design, architecture and landscape design enthusiasts will be thrilled to find many familiar names and industry hard-hitter's homes and projects included. While it's an impossible to encapsulate the depth of beauty and information in this brief review, I hope that this small sampling will whet your palate for the 325 page feast that is "Out East"! This new release from Vendome Scriptura would make an ideal gift for the Francophile or travel buff in your life. Full of beautiful photographs, it's also a perfect amount of an overview for those who want to hit the highlights without being bogged down by informational minutiae. Even for someone like myself who has been to Paris multiple times, there is so much to see, do and sample that it's easy to feel a bit overwhelmed when attempting to pare down your priorities to a somewhat manageable agenda. From the finest dining establishments to unassuming yet exceptional bistros and sidewalk cafes, we are all well aware that Paris ranks as one of the world's greatest foodie destinations. Who better to be making the recommendations than the folks at Laduree, the very symbol of French sophistication and lifestyle? This great little volume is divided into 4 sections encompassing "Cuisine", "Fashion and Beauty", "Interior Design" and "Culture". The more than 200 color photos will do plenty to whet your appetite for a journey to Paris, whether for the very first time or as a seasoned visitor. Shopping is definitely one of the best parts of being in Paris and the art of merchandising is taken to a whole new level there. Even the simplest of neighborhood markets have such a gift for display and presentation that all of their offerings, down to the most commonplace commodities, are made to look irresistible. Paris always delivers a level of magic hard to find in life. A trip there is just one of those things in life that proves to actually be better than you had imagined. For me, it IS all it's cracked up to be. In fact, I am long overdue for a visit and Paris by Laduree isn't helping to lessen my cravings. I will just read up, take notes and plan for the next opportunity I have to visit this exceptional city! Fall is my favorite time of year, even though here in Florida we don't get any Fall colors, but the humidity does begin to lift as the rainy season abates. Another nice perk is that all of the new design/decor books come out. "House In The Country" is one of these long-awaited titles from Vendome Press that is debuting. Famed architect/designer husband/wife team Peter Pennoyer and Katie Ridder have spent decades designing for their lucky clients, but this is the story of how they built their very own dream house in Millbrook, NY. Far from cookie-cutter generic-ness (my made-up word), they used their unique talents and erudite tastes to create a truly unique home and garden (Katie is quite the horticulturist) for their family. A refreshing departure from the status quo and the visually constipating boredom of American mass marketing trends for architecture and decor. This is one of my favorite rooms in the 227 page book. Lush photos by interiors photographer Eric Piasecki and text by contributing author Anne Walker are a treat. You will be transported to Millbrook for a delightful tour and backstory on this gem of a Greek Revival-inspired house and its' grounds. If you are not yet familiar with Chairish, it's a great resource to find all kinds of great vintage pieces for your decor. I teamed up with them to create a moodboard here based on the concept of a feminine version of a "man-cave" built around these great vintage bar stools, of which you can peruse a wider selection here. A place where the ladies can relax, gather and just chill. My theme is more of a coffee/tea bar as opposed to a traditional bar. A cheerful and bright spot for a little caffeine boost and some convivial conversation. Does this space appeal to you? 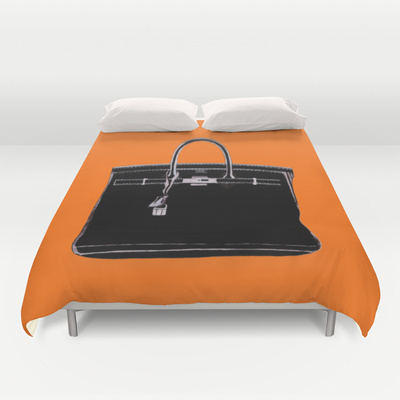 What would be a "must-have" in your "Woman-Cave? 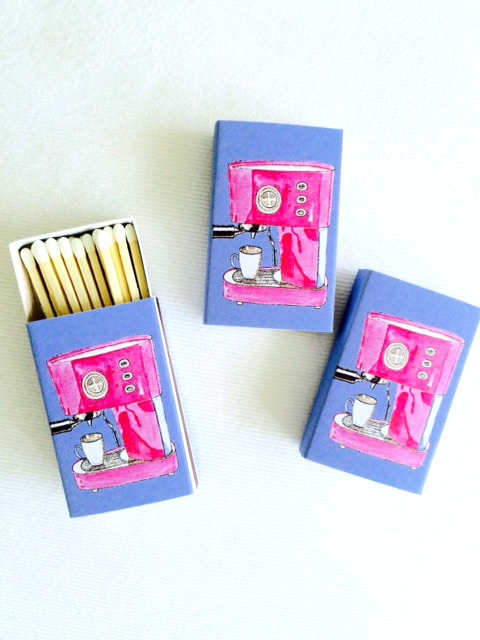 If you'd like to purchase these yourself, here's a direct link to my matchbox selection. I hope that you all have a wonderful weekend and as always, thanks for your support!! This room with gorgeous lattice-work detail is just one example of hundreds of sumptuous color photos in the sparkling new Vendome Press volume "Palm Beach Chic" by Jennifer Ash Rudick with photos by Jessica Klewicki Glynn. This book is chock-full of eye candy and gives some of the best examples of Palm Beach's diverse style I have seen yet. If you're a fan of Palm Beach Style or beautiful books in general, you will be very glad to acquire this truly beautiful book. Featuring both stellar interiors and breathtaking outdoor shots, it does a fine job of encapsulating Palm Beach style both old and new. Over 300 pages of lush photos and descriptive text, this would make a perfect gift for a loved one or a great acquisition for your very own design library. I don't know if you're like me, but I never feel fully "together" without my watch. Even though most of us habitually carry phones everywhere that keep precise time, there's something super appealing about wearing a watch you love. It somehow takes your outfit up a notch and unique details and high quality craftsmanship can separate the everyday utilitarian from a piece that you really want to wear all the time! Being an artist and designer, the visual side of things is pretty important to me......This sustainable wood watch from the "Cora" series by Jord caught my eye the first time I saw it. It's made from real Maple and I love the way the lavender face with real Swarovski crystals compliments the light wood grain. Each piece is completely unique because of the grain on the case and band, add to that a sapphire crystal face and a 6103K automatic movement with 21 jewels and it not only looks stylish but also functions flawlessly. There are so many styles - both men's and women's - and all are a refreshing departure from the generic watches everyone else owns....so definitely check them out here. So excited to have my Ginger Jar No. 7 in the June 2015 issue of House Beautiful as I have read this magazine since I was a kid and used to pore over every page and clip out my favorite rooms! 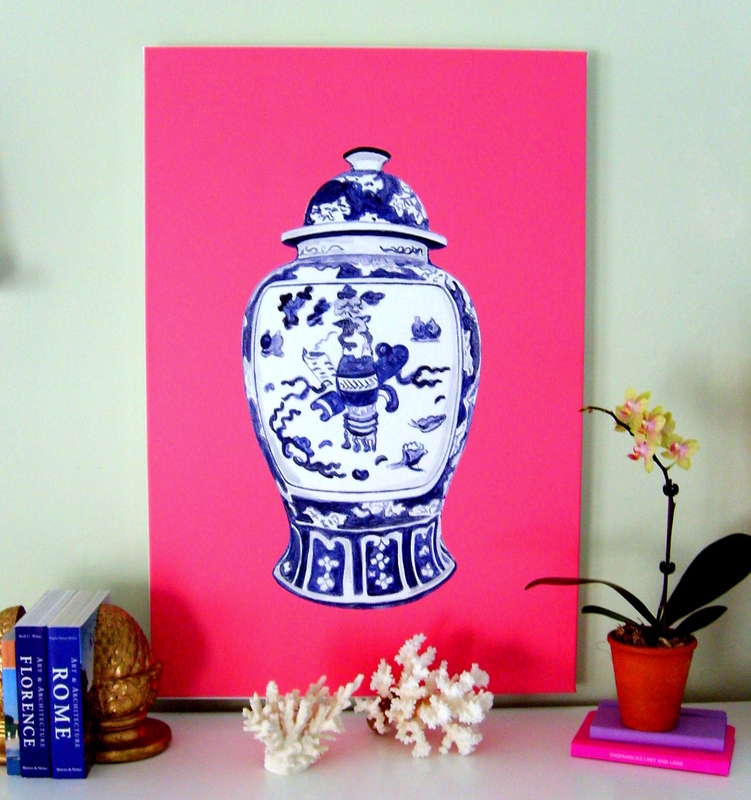 CHECK OUT MY SHOP HERE AND HAVE A WONDERFUL WEEKEND! THE WORLD ON A PLATE - NEW RELEASE! I was recently given a review copy of The World on a Plate. It was penned by Mina Holland the erudite (and funny) editor of British Guardian Cook. I loved it! For someone who loves to eat and travel, it was a delightful read. The best part was that it didn't involve packing a bag, going through security or being shoehorned into tiny spaces with frustrated tourists and delayed schedules. I found it to be very easy reading with an overview of 40 of the world's best cuisines colored with interesting backstories without delving into information overload. Mina leaves you with a handy list of pantry essentials for each type of cuisine and a recipe or two highlighting the essence of what makes that particular region's offerings unique. For example, I would never have dreamed of adding chocolate to a stew, as they often do in the Catalan cooking of Spain....who knew? She trots the globe armed with keen powers of observation and a discerning palate coupled with down to earth humor and unaffected practicality. This delightful tome - half history book and half cookbook - features more than 100 recipes, many of which I cannot wait to try myself! Check out this brand-new Penguin release for yourself - or pick it up as a gift for the Foodie in your life. I am sure you'll be glad you did! Look for Annechovie matches and stationery on One Kings Lane as well, April 23-May 15! I know it's been a while, folks! I have never had a gap this long in the history of my blog. I've had a lot going on - between my sales on One Kings Lane, doing commissions, developing new products and generally living life, I have fallen behind with my blogging. I think that some of us who started blogging prior to 2007 are no longer as diligent, especially with the rise of Instagram and other venues taking priority. I'm not sure who finds the time these days, but I admire those who've kept it up and miss all my blogging friends and clients and interacting more regularly with you! Toodaloo for now my pretties! I hope that your 2015 is off to a great start! I spent New Year's Eve and the first week of the year in the Cote D'Azur, France with my wonderful husband exploring, relaxing and eating (not necessarily in that order!) The weather was gorgeous every single day and we had a terrific time. The city of Nice was a part of Italy until 1858 when it became a part of France. It still retains a huge amount of Italian influence with architecture, cuisine and language. 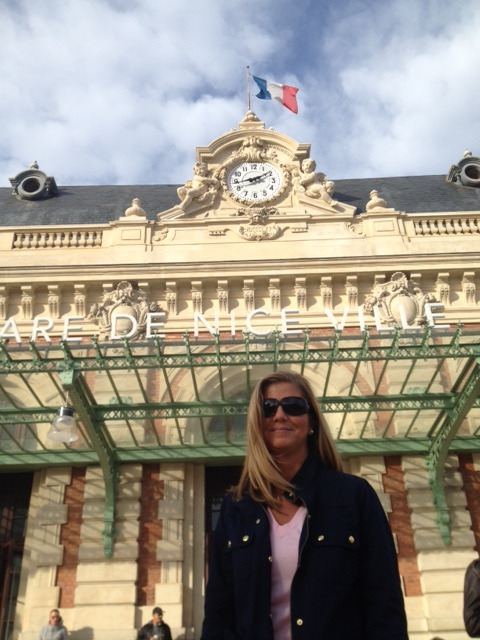 Sometimes I had to remind myself I was actually in France because it felt so similar to Italy. Here I am in Garibaldi Place. Many famous artists such as Matisse, Picasso, Bonnard and Chagall spent time in Provence and the Cote D'Azur and I can see why. The art, the architecture, the landscape, the Ocean and the light are really something! I was charmed by this art store in the city center. My daily breakfast while in Nice usually consisted of a "pain au chocolat" or chocolate croissant and coffee. I decided to take a break from kale smoothies - I was on vacation after all! Apparently, colored toilet paper is not extinct in France. 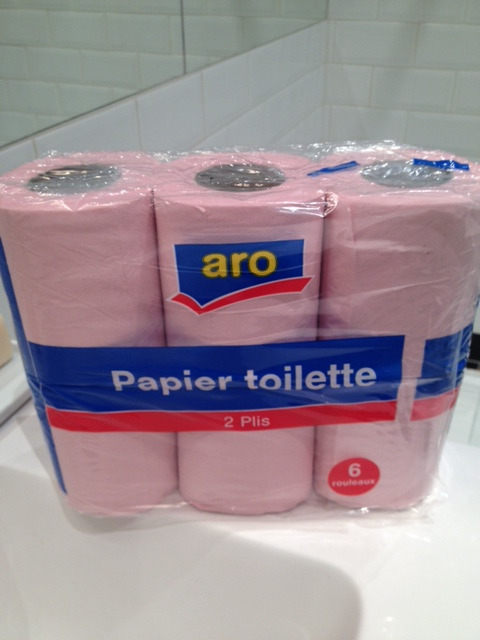 I haven't seen pink tp since the late 70's! When we ran out of tp, my efficient husband ran out to the store across the street and picked this up - it was all they sold and the color was quite alright by me. Pretty cool architecture at the train station, no? All the gorgeous flowers and potted trees on street stands were tempting and the flower market at Cours Saleya made me drool. Too bad bringing back plants is too unwieldy and forbidden in customs. We were happy to see that all of the Christmas decorations were still on display. This was one of the main shopping thoroughfares on Avenue Jean de Medecin. One of our favorite places was Monoprix - a French department store similar to a Target. Most of the merchandise is not anything to write home about, but their great food selection is another matter. We spent a long time just perusing all of the unique culinary offerings and especially enjoyed picking out a few pastries. Very hard to settle on just 1 dessert, but my pick was the tart citron with meringue and I was far from disappointed! I couldn't get over this.......is this suckling pig afraid of the flu or are they concerned his snout might crisp up before the rest of him? This charming and tiny umbrella shop was founded in 1850 in the historic center of the old town. Loved the neon umbrella over the awning. This impressive edifice is the court or "Palace of Justice". The architecture and coloring of the buildings here is amazing. This delicious concoction is a regional specialty called "socca". The line for this vendor was long, but it's definitely worth the wait. French Riviera street food at its best. Socca is made from chickpea flour, water and olive oil. Simple, but amazing. We bought a copper socca pan and flour and lugged it back home with us. We have already tried making socca at home and it was actually almost just as good. I guess it's hard to mess up a recipe with only 3 ingredients. Our private little oasis in the city. The famed Negresco Hotel on the main drag, the Promenade des Anglais. 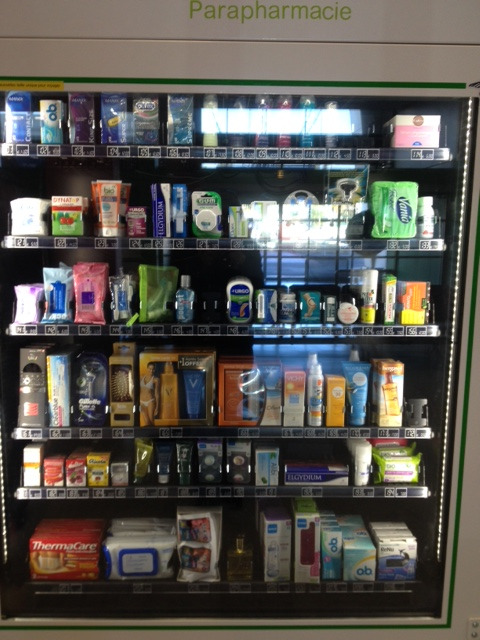 I was amused by the vending machine at the airport - French style necessities and no bag of Doritos in sight! Hanging out in Monte Carlo, which is beautiful and immaculate but also has a sort of Disney-esque, surreal amusement-park-like quality to it. There are some real unique characters crawling all over. Definitely not the sort of place for the understated or discreet anything. People come here to see and be seen and it's pretty entertaining, let me tell you. Cap Ferrat was much more my speed and my favorite spot...had an amazing lunch here at La Goelette. The risotto fruits de mer was incomparable and the service warm and exceptional. I loved the floating creche in the port at Cap Ferrat. Back in Nice at the Musee Matisse. An interesting place as I am a long time fan of Matisse but a few of the employees were not exactly reflective of the cheer and warmth in Matisse's work. Ahem....they do not seem very happy to be sharing his work or life with the museum goers - even after you pay to get in and however much you are quiet and keep to museum etiquette. We found almost all of the French to be very courteous and helpful, but this place had a distinct pallor of sadsack snobbery and resentful coolness about it, especially in the museum shop. Maybe we were just there on a "grouchy" day? Having French ancestry in my background, France is always an especially great place to visit and the food and weather were especially delightful. Next time we want to visit Antibes, Cannes, Menton and St. Tropez but meanwhile it's back to reality and translating some French inspiration into artistic expression back home at the studio. Merry Christmas, Happy Holidays and thank you so much for your support and for reading Annechovie. For those who have been faithfully following these nearly 8 years I've been blogging, (even though posts have been sparse lately) I truly appreciate you all. I am celebrating at home with my wonderful family and then my husband and I will be heading off to France after Christmas to ring in the new year. Lots of good things to come in 2015 and so thankful for all the blessings and trials of 2014 as well - mostly thankful that my Savior humbled Himself as a vulnerable newborn all those years ago to come to this broken world and give us all real Hope for a peace-filled future. Love to you all! This new release from Vendome Press was fascinating from both a sartorial and athletic perspective. Having never rowed myself and having limited exposure to the lengthy tradition, I learned a lot from reading this. I guess I never had considered the roots of the "blazer" and how it came to be in both England and America. Rowing has a rich tradition and the author of "Rowing Blazers", champion rower Jack Carlson covers a lot of history of the sport AND the dress as well. It's not just a pretty picture book (though it IS visually very pleasing) for preppy coffee tables - you will definitely learn a good deal! With principal photography by F.E. Castleberry, this is a richly illustrated tome that will make a nice edition to your library or a great gift for a lover of rowing, fashion, history or all three. I also got a kick out of the fact that the cover photo shows a champion rower in the blazer of my Dad's alma mater. Pretty cool! Vendome Press kindly sent me a copy of decorator Markham Robert's new book "Decorating - The Way I See It" and I relished curling up in my armchair and leisurely perusing the pages. 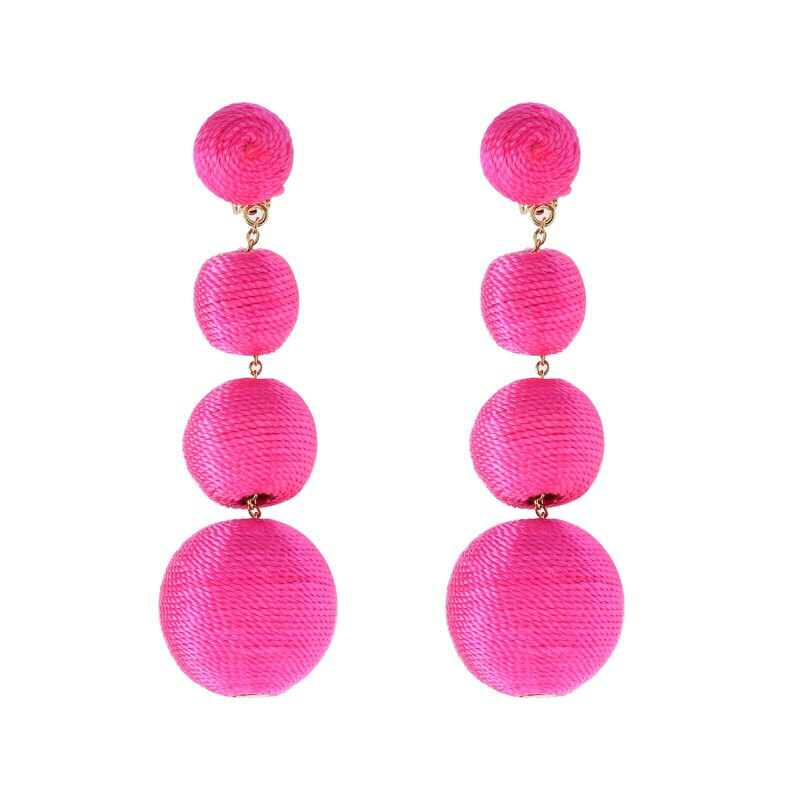 Markham has a phenomenal eye and a real gift for both color and creating lively interiors with a twist on the traditional, while curating a timeless quality to his designs. With over 260 pages and 300 color illustrations, this recent release will inspire you and delight your eyes. Markham began his career working for the reknowned and well-esteemed Mark Hampton, a legend in American style and design and his influence is recognizable in Markham Robert's own style. Be sure and add this to your gift or reading list - it's sure to be a classic for years to come and you won't be disappointed! From now through Sunday, October 26th, receive free worldwide shipping on all items from my Society6 shop, including pillows, totes, framed prints, canvases, rugs, clocks, shower curtains and duvet covers! Click here to shop!